Home / Entertainment / News / Travel / Video / This British Daredevil will show you that he isn't afraid of heights at all! This British Daredevil will show you that he isn't afraid of heights at all! 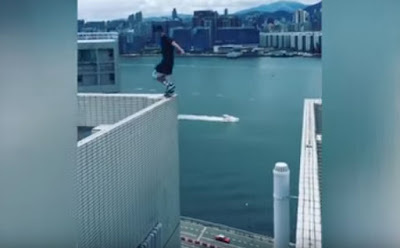 Watch how this British daredevil and parkour enthusiast jumps off between from one building to another one without wearing any protective gears! This will surely give you goosebumps! 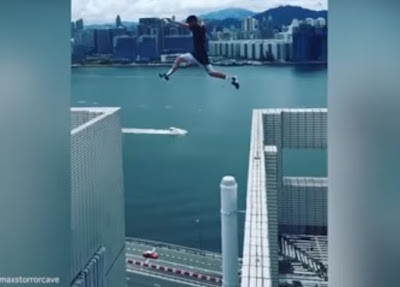 A heart-pumping slow motion video clip shows a parkour enthusiast jumping between two huge 25-story buildings in HongKong. Max Cave, 24-years-old, a member of U.K. based Parkour team Storror, showed that he isn't scared of heights at all! In the video, Cave was just wearing his normal clothes, a shorts, trainers, t-shirt and a baseball cap. 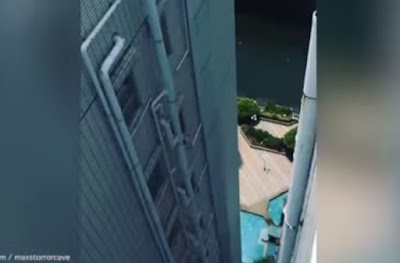 The British daredevil have completed a 'scary' leap between the two huge building and lands on a tiny 15cm-wide platform right on the edge of the next building without wearing any gears or there nothing that will catch him below. He uploaded his jaw-dropping video on Instagram and captioned it with, "Warming up in HK getting ready for the next couple of days filming. Running off after the stride was a bit scary." Many were impressed and extremely horrified in what Cave did to that two buildings. After he posted his video, it has already gained 164,000 views on his page. Cave's team, known as the Storror, is a group of 8 young British guys who were popular by documenting and publishing on social media their jaw-dropping yet entertaining and skillful parkour adventures. These daredevils have already scale and jump over roofs and skyscrapers worldwide, from Israel to Sweden to Turkey.